A stash pocket! Perfect place to slip a key or credit card if you don't want to carry a bag and your clothes are pocket-less. All scarves should have them! When taking apart clothing to use for its fabric, there are often buttons, pockets, etc, that are leftover. Reinventing these pieces creatively makes use of already constructed pieces, which saves time and adds a nice design element. Plus, it makes you feel extra clever! That little loop I made to cinch the two sides together already had the button hole in it, so it took only minutes to create. 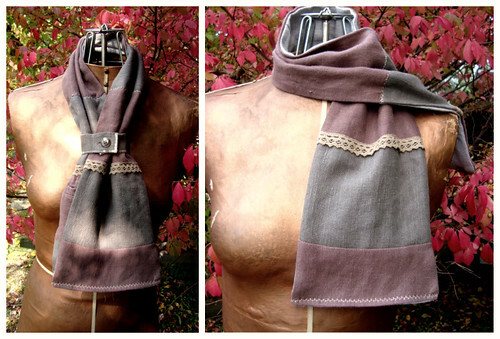 Would you like to make a reinvention scarf of your own? These are so simple that they don't quite warrant a tutorial, but I'm jotting down the how-to just in case it would be helpful.This is a great project for a new sewer. The process is just as fun as the outcome is lovely. You'll need to go through your closets or the racks at your favorite thrift store to find the perfect clothing that inspires deconstruction. Linen, wool, and corduroy are my favorites for this project. Decide the width of your scarf. The one above was 7 inches before sewing. Cut lots of lengths of your coordinated fabrics, keeping all of the widths the same. Lay them out on the floor to create a pattern. If you have a pocket that you're planning on incorporating, make sure it's positioned in the right direction and towards the bottom of one side. When happy with the combination, stitch together until the scarf is your preferred length. Try it on as you go to see what you think. Iron seams flat. If you want to add embellishments like lace or applique do so now. Use one color for the back piece. I used the leg of a pair of thrifted linen pants. Pant legs are great sources for fabric for long scarves. Cut the fabric to match the size of the "patchwork" front piece. Place right side to right side and stitch all around the edges leaving a small opening at bottom of one side. Wrap around your neck and take a walk. I have another scarf with a twist that I'll share next week. Hope your weekend is filled with love and creativity! Your scarf reinvention is very clever. I like it - and think I may have a few "extra" pockets around. My son's jeans always wear through the knees first, and then he outgrows them (since he's still young). Some of those pockets could be put to good use for such a project. Your scarf project is GORGEOUS, Maya !!! 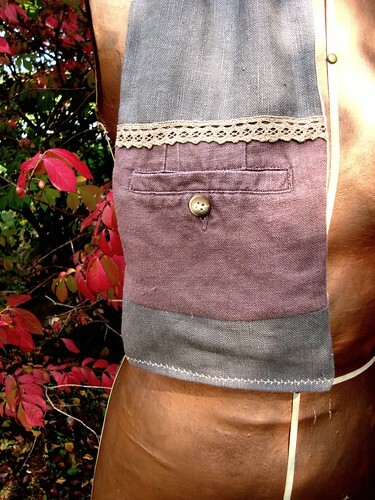 Love your clever pockets and your choice of repurposed linen and fabrics ! I easily guess your excitment !!! Thanks so much for sharing your brilliant ideas. Wish you a happy and inspiring autumn ! Hugs from South of France. Love the scarf, the colors, material and especially the extra pocket. You're so right: it's perfect when wearing skirts or dresses without one. Super idea! I'm gonna make one! 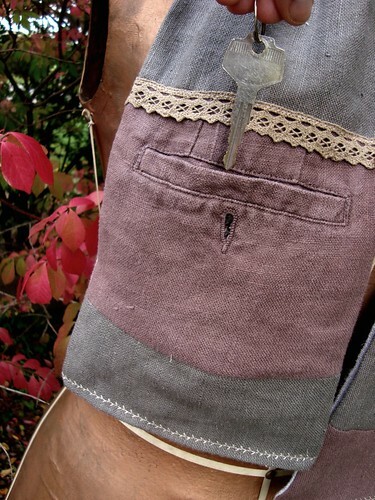 I love the pocket - what a cool idea! I can't tell you how often I'm wearing a skirt with no pockets, and am stuck carrying a bag just to hold my keys and phone. This is practically revolutionary! Clever and beautiful! I admire the way you allow lovely fabric to ingratiate itself, nudging its way into creative works of functional art. Thanks for sharing your work. very clever! it's a beautiful scarf. i love the colors and the special touches you've added to it. i love a scarf with a pocket! very very cool looking and your workmanship is divine...well done you! What a great idea! All scarves should have little pockets! I love finding ways to use every little bit up. One of my favorite vintage quilts has pieces cut from a man's shirt, including the button placket and a piece with the side seam running through it. So charming. Including the pocket is ingenious! Now I can take a walk thru the neighborhood and have a place for the house key! Thanks for sharing the how-to. I love the pocket especially! I'm a little jealous, it seldom gets cold enough to wear scarves here. It looks great, Maya, very clever and very wearable. love the colors and little details of crocheted lace and stitching. the pocket...pure genius! maya, you're a genius! a scarf pocket!! i love the look and utility of this scarf. i've got to go thrifting soon. Great scarf! The pocket and loop make it extra special. I'm inspired! Terrific idea! Perfect for when it gets cooler here in AZ and I take the dogs for a walk. I will definitely be trying this. Thanks for sharing!